Don’t draft a kicker in the first round. 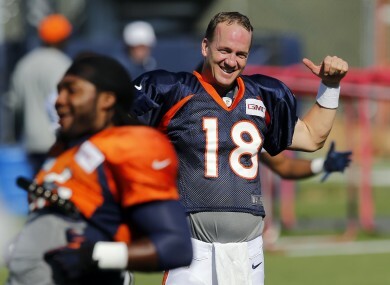 Peyton Manning agrees he's likely to go quite early in most drafts. AMERICAN FOOTBALL IS a simple game made complicated by the hours and hours of anguish spent wondering whether or not you should start your slightly injured star running back or take a chance on an untested rookie. It’s on such decisions a whole season can hang, the difference between winning an losing a championship. Fantasy football is that important. This year though, there’s something of a sea change happening in fantasy football with the annual first round scramble for running backs no longer as important – though still a critical position – as it once was. It’s boring, it’s tedious but the draft is the making and breaking of your fantasy football season so if you don’t get the right players on the night, you can probably kiss goodbye to the playoffs. There are literally hundreds of resources out there for those of you who want to get that edge in winning your league. I know one guy who has dedicated an hour a day, four days a week to just studying for the fantasy football season. That’s probably taking it too far but he’s won his main league the last three years running so maybe his approach is right? Either way, the least you should do is have a ‘cheat sheet’ with you on draft night with a ranking of the players you would like to see end up on your team. Okay, maybe not essential but you’ll be a better person if, instead of ‘Steve’s Steeds’ you come up with a clever team name. There are certain rules though. Choose wisely though, it could be the difference between your friends/fellow competitors briefly nodding their head in admiration and not. If you told me I’d be typing this even two years ago I’d have laughed but the fact is the era of running backs making up the entire first round is over. There are a number of reasons for this, notably the rise in pass happy offences and the tendency for NFL offensive co-ordinators to focus on a rotation of running backs rather than commit to a single load carrier. Don’t waste a pick on a kicker or defence before the last two rounds. Last year the Seattle Seahawks defence were the top defence in fantasy and yet averaged just three points per game more than the Rams who ranked seventh. Compare that to quarterback where nearly nine points per game separated the same positions while there were six ppg between the first and seventh ranked running backs. And remember you can find hidden gems everywhere in the draft. Last year, for example, the average round Josh Gordon was picked up in was the twelfth. Gordon, of course, was the top receiver in fantasy football in 2013. There is much more value out there than a good defence. My final piece of advice is a simple one. Take part in as many mock drafts before your actual draft as you can. This helps for two reasons. Firstly you get a feel for how likely it is that you’ll get Megatron falling to you late in the first round; hint, it’s not. Secondly you’ll see just how much of a sleeper pick that Bears receiver you think nobody has ever heard of actually is. So that’s it, go forth and draft well. As long as you’re not playing against me. If you are, I hear that Tim Tebow guy is going to make a comeback, you should pick him up in the first round just to be sure. Disagree? Of course you do. Let us know your tips for the fantasy football season in the comments below. *All information is purely subjective but based on a ten-team standard scoring league. Email “Is this the real life? TheScore.ie's guide to your NFL fantasy football draft”. Feedback on “Is this the real life? TheScore.ie's guide to your NFL fantasy football draft”.